You’ve been a die-hard science fan for as long as you can remember. Working behind the scenes, like a silent superhero, is your preference. And, you want to enter the workforce in a stable career. Lean in; we have a fabulous idea for you. Medical Lab Technician training is the way to go. 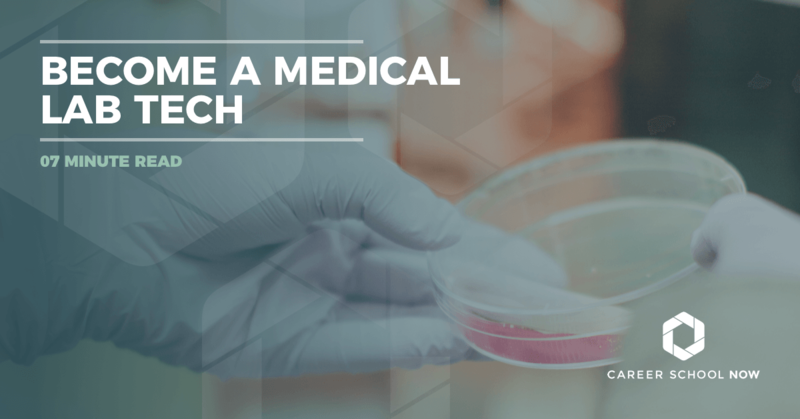 Learn about what’s involved in becoming a medical lab technician and start your journey today! After you get blood drawn, or pee in a cup, or have whatever other bodily samples the doctor ordered taken, all that stuff ends up in front of a medical lab technician. Medical Lab Technicians work in hospitals and labs performing tests on patient tissue, blood, fluids, and other body-related samples. Even though they are behind the scenes, medical lab techs play a significant role in diagnosing and preventing contagious and deadly diseases like cancer and HIV. There are many different sophisticated machines such as microscopes and cell counters which are used by medical lab technicians to perform their duties better. Study all aspects of a blood sample for transfusion purposes by finding out number of cells, blood type, and compatibility with other blood types. Specialties include microbiology, blood banking, hematology, clinical chemistry, molecular biology, cytotechnology. Aside from the strong desire and even more solid work ethic that medical lab techs should possess, there are other qualities that employers are looking for when hiring. Trouble-shooter, not trouble-maker! Loads of issues can arise for medical lab technicians, and being able to think quick and problem solve is as necessary as, say, coffee. Must love thyself. So, part of the thing about working as a medical lab tech is that you may be surrounded by many, but you’re pretty much working on your own. You care. You care about people and their health. And, you feel a strong pull to helping to heal through your work. A glory-less job that someone needs to do. And, you don’t mind that you get little to no recognition on your discoveries. Because, you’ve already saved one life and have moved onto the next. You’re kind of a techie. Working in this field, a medical lab technician needs to know a little bit about a lot of techie stuff like computers, computer software, and other electronics. No video gaming skills needed. You’re a big talker. Communication is essential, and it’s important to be able to convey your thoughts effectively. And, you don’t need to just be able to speak well, but writing and listening skills are critical, as well. Graduate high school or get a GED. High school classes such as algebra, chemistry, and physics will prepare you for this career. Go get an associate’s degree in clinical or medical lab technology. Yes, certificate programs are also an option, but more employers are giving preference to medical lab techs with associate’s degrees. *There are some hospitals that offer medical lab tech certificate programs but they are limited, and admission qualifications vary widely. Once you’ve graduated from an accredited lab tech program, you can get your certification so you’re a Certified Medical Lab Technician. It’s not required in all states, but it does make you more hireable. Some states require that their medical lab technicians get licensed. Each state has different requirements that must be met, so it’s important to call your local state boards to find out what your requirements are.American Medical Technologists, American Association of Bioanalysts, and American Society for Clinical Pathology. Not all states require lab technicians to be certified. However, most employers prefer to hire certified medical lab technicians. By earning a certification, it proves to employers that they can carry out their tasks in a professional and knowledgeable manner. For the medical lab tech, certification often brings better employment opportunities, along with a larger paycheck. Route One: An associate degree or at least 60 credit hours from an accredited college or university. The successful completion of an accredited medical lab technician program within the last five years. Route Two: An associate degree or at least 60 semester hours of relevant course credits from an accredited program. This must include 6 semester hours of chemistry and 6 semester hours of biology, PLUS the ASCP certification. Route Three: An associate degree or at least 60 semester hours of course credits from an accredited college program. This must have included 6 semester hours of chemistry and 6 semester hours of biology, AND to have successfully finished a 50 week U.S. military medical laboratory training course within the last ten years. Route Four: An associate degree or at least 60 semester hours of course credits from an accredited college. This should include 6 credit hours of chemistry and 6 credit hours of biology, PLUS three years full time acceptable clinical lab experience in blood banking, chemistry, hematology, microbiology, immunology, and urinalysis/body fluids in the U.S., Canada or an accredited laboratory within the last six years. The application must be done online. Applicants must have a valid driver’s license, the name of the accredited and approved college or university, program start and official end date, and name and contact information for the Program Director. Submit the proper documentation including the application summary, acknowledgement letter, authorization to test letter, and review/practice exam. To maintain the AMT certification, an annual fee must be paid, and comply with the Certification Continuation Program (CCP) every three years. A medical lab technician is one of those careers that can hold unlimited career options depending on how far you’d want to go. Many medical lab techs continue their education post bachelor’s degree to become a lab technologist, and then a lab manager or supervisor. Lab managers and supervisors hold advanced degrees in management, biological sciences, or medical technology. A doctorate would allow being promoted to lab director. Medical lab technicians can also choose to specialize in areas such as immunology, histotechnology, clinical chemistry, blood banking, and microbiology. Science technicians, dentist techs, and veterinary techs are some career options for medical lab technicians. The Bureau of Labor Statistics reports that medical lab technicians earn $38,950 annually. Entry level medical lab technicians made over $26,000 per year, and the top 10% brought in over $61K. This is a full-time job, often with irregular hours such as evening and weekends, depending on when the hiring medical facility is open. Through 2026, employment for medical lab technicians is expected to grow 13 percent. This is faster than most other occupations. The aging population means more diagnosing of illnesses being done. Medical lab techs who have completed an accredited program and have gotten licensed and certified will have a leg up on the competition.